Prosciutto, Parma, Serrano, Iberico, Bayonne: A dry cured ham by any other name hopefully tastes as sweet. Last fall, along with three other people, I bought a Red Wattle pig. I was actually part of a larger group of 12 people who bought three little piggies. We bought them when they were not yet ready for market and still happily being fattened by the farmer. Of course, when we took delivery, our pig came to us all nicely packaged according to our specifications and ready for eating. This was the second time we did this and we learned a great deal our first time. Namely, we learned that 4 people is just the right number for pig sharing. We also learned something about each other. (A) Am I a “Just gimme my Pork” type of person? (B) Am I a “Just gimme my Pig” type of person? Brilliant! And, obviously, NO, I am not a wuss. The “just gimme my pork” folks had their bacon cured, their hams cured and their sausage made for them by the processor which the farmer hired. They were not interested in offal, either. Me, on the other hand, I definitely want my pig unground, uncured and butchered in a way that leaves me plenty of options. From those first pigs, I cured a whole mess of bacon and guanciale (pork jowl) for my team and a few other folks. It came out fabulous and we ate gourmet BLT’s with micro greens and homegrown tomatoes all the late summer long. We were blown away by how good bacon could be. Wanting to learn about charcuterie, I took the liver and I made homemade braunschweiger. The first batch ended up in Sadie’s dish but the second batch came out really good – we ate it all up. Then I tried my hand making boudin blanc – a wonderful, mild white sausage made from a mix of chicken, pork and cream. What could be bad. My family at that up in a hurry! After we got the Red Wattle, I invited a group of guys from the buying group over to my house and we had a sausage making party. You can read all about it here. We made all sorts of wonderful things including two kinds of salami, chorizo and bratwurst. Even after that, I still had a little sausage meat left so I combined it with some humanely raised, pastured veal to make bockwurst. We have been dining on that for a while and it is delicious! With that first pig, even though we were the only group who said “gimme my pig” it was decided (not by me) that the hams would be cured at the processor. 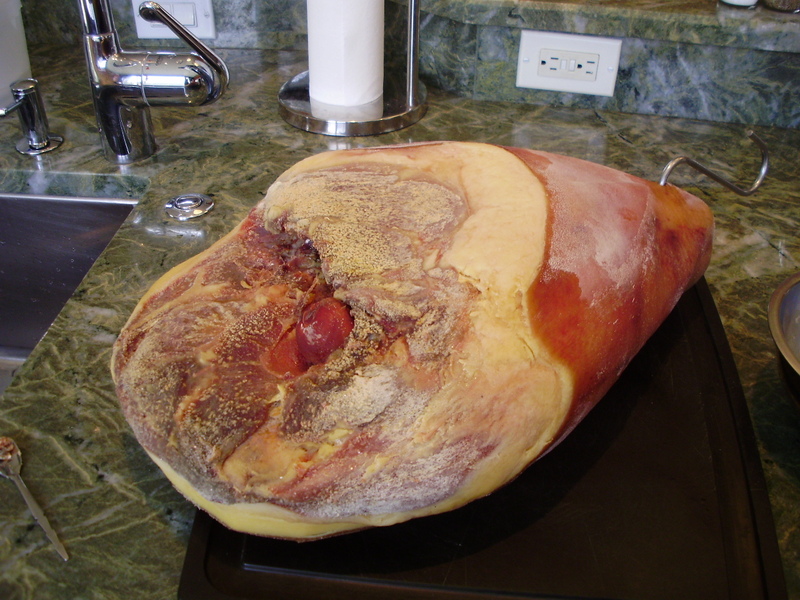 I didn’t really care because I don’t eat ham…unless it is dry cured, prosciutto type ham. The other ham is just yucky to me. I find it to be watery, salty, squishy and generally unappealing. Even our super pure, all natural, ham that came from our happy pig was not something I wanted to eat. I ended up trading mine to another team member for some other pig parts. I must admit, I regretted not having been able to convince my teammates to let me make the ham into prosciutto. With my Red Wattle team, however, it was different. Folks were happy to let me take control of one entire leg for dry curing. How exciting to me that I was going to be able to push my charcuterie skills further. I did my reading and my studying and I contacted my friend Josh Galliano, an incredibly talented, generous, kind and very cute local chef. Josh agreed that he would show me the ropes with the ham. Being the really lucky one, I got to spend an afternoon in the kitchen at Monarch restaurant, an experience that energizes and inspires me. While I was waiting for instruction and because I am not one who can hack standing around doing nothing, Josh willingly set me to work cleaning and chopping vegetables for a broth that he was going to use in one of the evening’s offerings. In between doing the myriad of things an executive chef has to do, he showed me how to remove the aitch bone from the meat without destroying the whole joint. Josh coached me in the proper way to trim up the meat and skin to make it ready to look like a prociutto. Finally, he gave me lessons on how to apply the cure to the meat to make the ham ready to be transformed into a dry cured delicacy. This is a process that will, when all is said and done, take at least 9 months. The first stage of the process is one in which the meat, coated with a cure made of kosher salt and a little bit of a chemical called instacure #2, is weighted and refrigerated. The length of the refrigeration is based on the weight of the fresh ham. Our 20 pound clod calculated out to 40 days during which time I drained the box in which the weighted ham sat of all liquid that appeared over the 40 days. This amounted to quite a bit! I also continually moved things around to make sure that the weights I had place on the ham (6 saran wrapped bricks) were evenly doing their work. The purpose of this is to compress the flesh so as to help the liquid to leave the meat and, in the meantime, to achieve that nice square, compact prociutto-like shape. When I took the meat out of the fridge at last, it had lost nearly 2 pounds. After that 40 days, the second stage began. For this stage, I had been monitoring the temperature of a closet that is located just inside of my garage where there is no heat. I ascertained that the temperature ranged between 45F and 55 F. This I learned was an excellent environment for the drying of a ham. So, I took the ham and hung it up in that very cold closet. I checked on the ham regularly just to make sure nothing bad was happening. I photographed the ham and sent the photo to Josh to get his reassurance. Everything was going well. 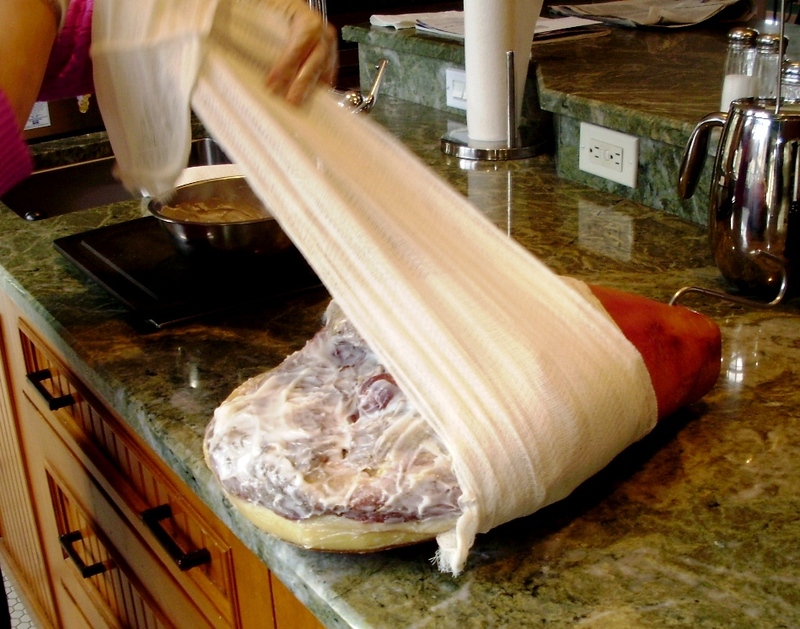 The ham needed to stay there for three months. 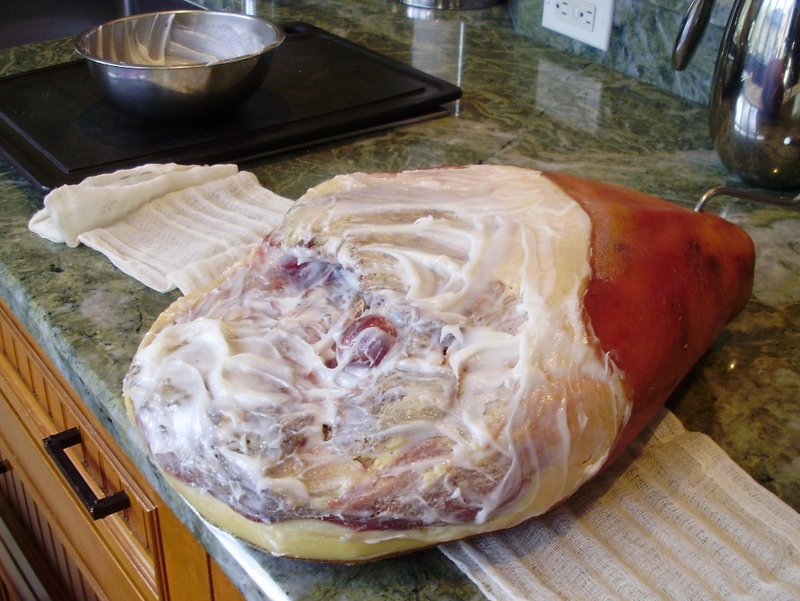 Here is what the ham looks like right now. Pretty gross looking, eh? On the other hand, it smells really nice and I have a really good feeling about the quality of dry cured meat we are going to be eating in a few months. For now, the second stage is over (i.e. 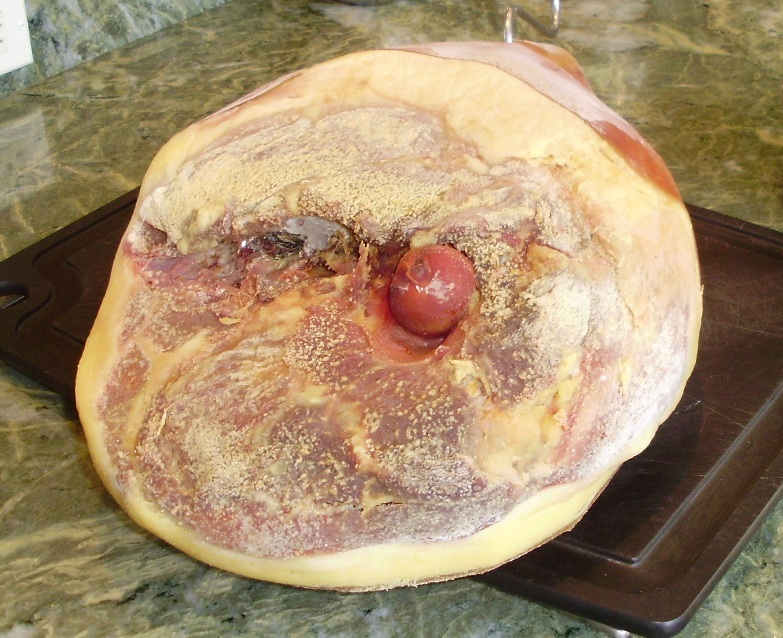 three months have now elapsed) and the ham must go into its third and final stage of curing. Here is how it works. 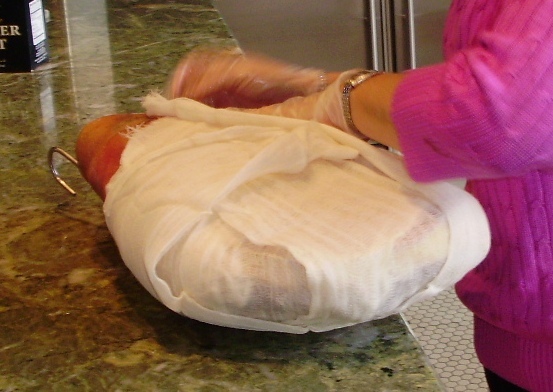 A towel moistened with salt water is used to rub the ham down and to take off the stuff that has accumulated on the outside of the meat. 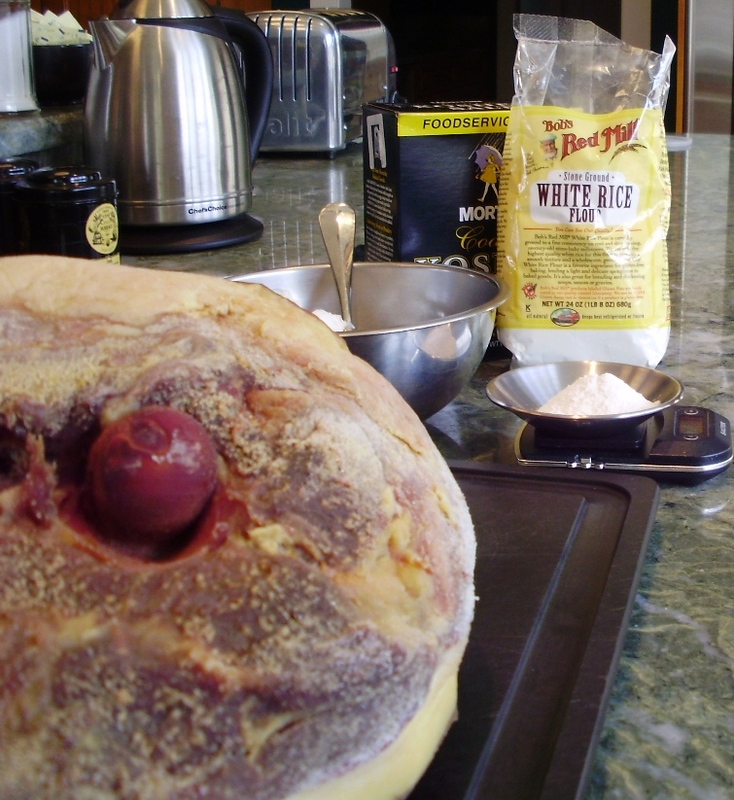 A mixture of lard and rice flour is prepared. This “sugna,” as it is called, is rubbed on the exposed part of the meat – that part not covered with skin. Some people recommend putting cracked peppercorns on the outside of the lard, believing that this keeps away bugs. My mentor Josh has not recommended this. 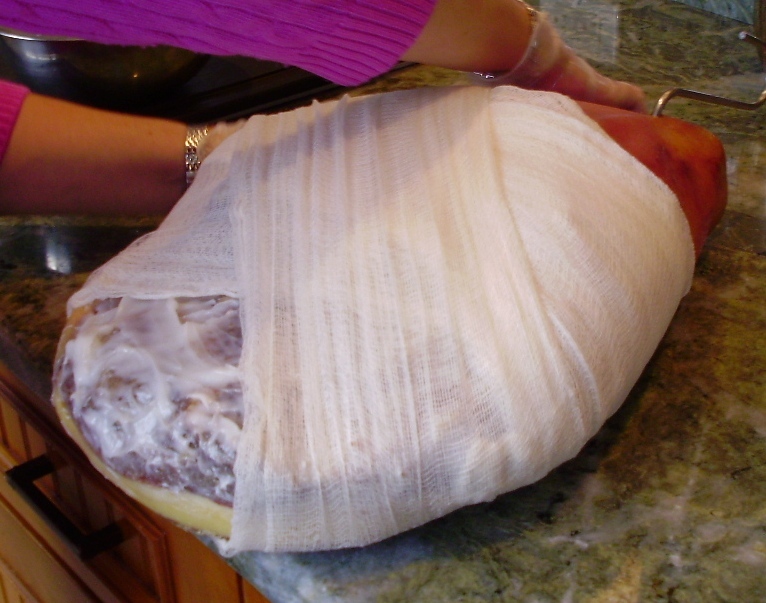 The whole thing is then wrapped with cheese cloth (to keep the lard in place, more or less. Then, the ham is again going to be hung to age further – but this time, due to the change of seasons, the temperature will be rising as high as 55-65F in the closet. Well done FFF. That looks delicious! But I have to ask, what is the ball looking thing in the middle? The joint? Thanks Mac. The round bone is the one that fits into the hip socket of the pig. It is the other part (the aitch bone) that fits over that one and which was removed in the prep. The removed one, also called the pelvis, is what older folks tend to break. Just wondering how it turned out. I’ll poke around a few of your other posts to see if I can find an update. Thanks Mike for asking. I have been able to write only a few times this summer due to illness but I am better now and I promise you I will do a follow up on the ham next week. It is a truly amazing thing to watch! 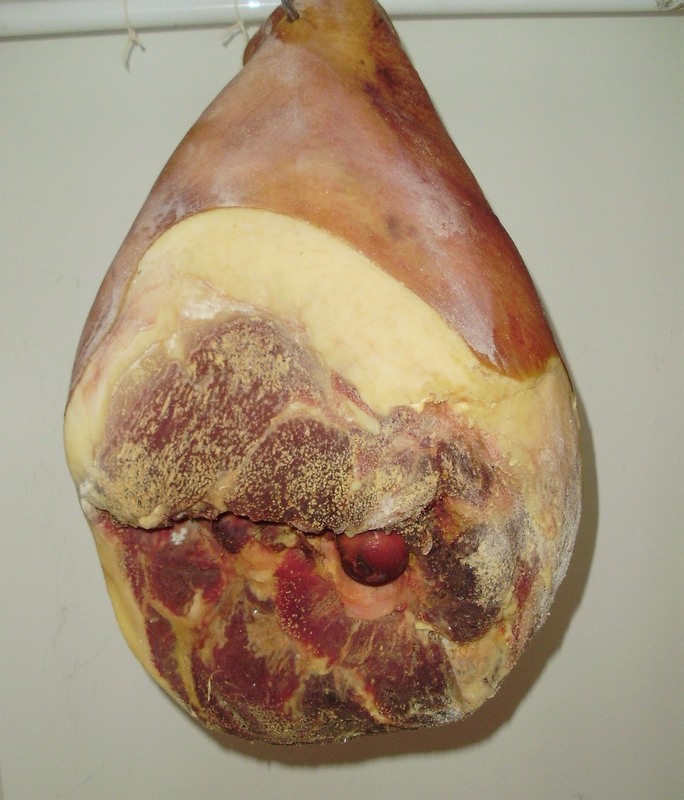 It is actually looking more and more like a prosciutto every day. So check back next week or fill in the thingy on my front page to subscribe and you will be notified when I post. How long was the second hang? How’d things turn out? Richard, Thanks so much for your interest. I am working on a post at this very moment about the ham. I should have it out by early next week. It came out delicious and I learned a ton. I put another ham into cure a couple of days ago. Please subscribe and you will receive email notification when the post is published. Thanks! I’m starting a ham today. I look forward to your post and will subscribe today. Could you share the recipe for that lard/rice flour paste? Sorry for my delay in responding. I use the recipe from Paul Bertolli’s Cooking By Hand. It calls for 4 ounces of leaf lard and 15 grams of rice flour and this should be enough for sealing the end of a nice sized ham. It is best to use leaf lard, which comes from around the pig’s kidneys, because it is very pure and hardens well. If you don’t have access to this, regular lard will do.